I was thinking about doing a post and bragging about all the painting that I have done around this house. I have painted so many miles of trim here I feel justified in boasting a bit. 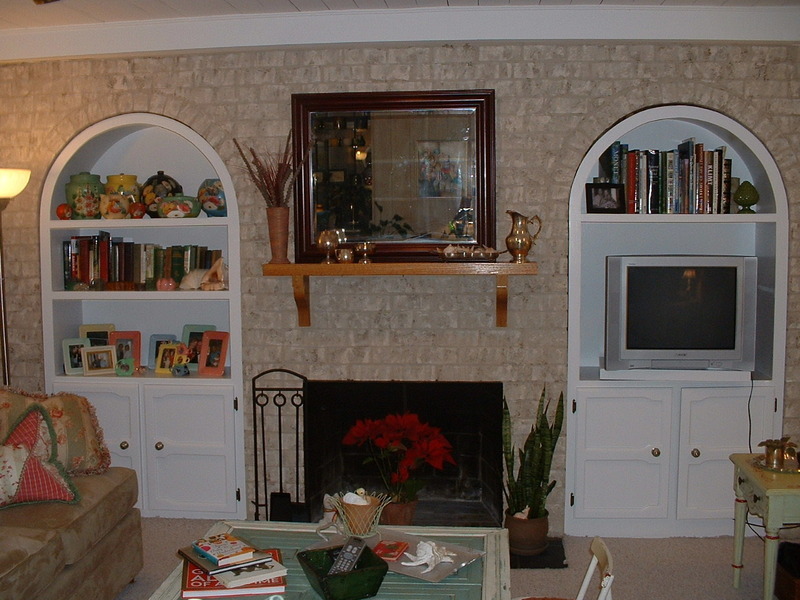 Then I remembered about the before/after pictures that I took in the family room of the makeover. We moved into this house 2.5 years ago and I believe it was about 9 months after moving in that I tackled the transformation of the family room. My family room is directly off the kitchen. I have a 1970s home so it does not have a great room, but rather there is a large doorway from the kitchen into the family room. That room is extremely dark because it has no windows but it does have a large sliding door onto my screen porch. I love my porch but it doesn’t allow much direct light into that room. 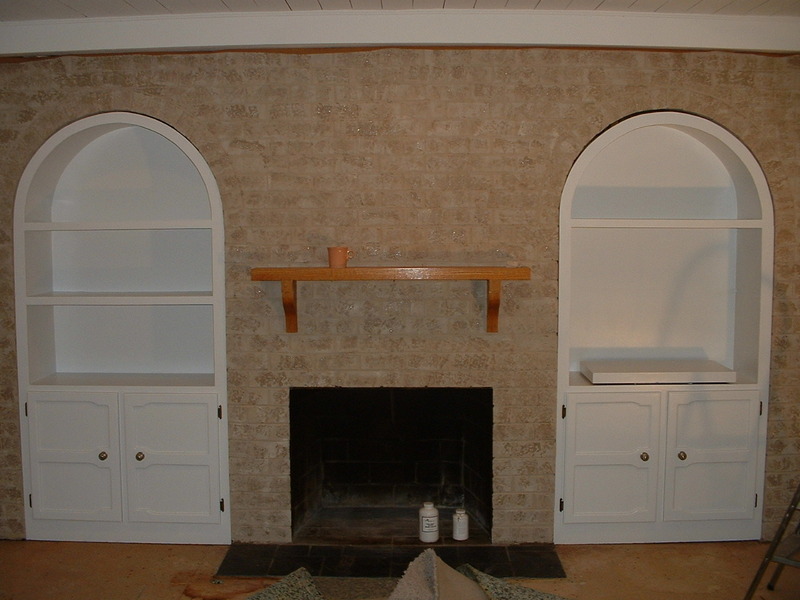 The room had worn berber carpet, a dark wood beamed ceiling and a brown brick fireplace wall with built in bookshelves. Very 1970s! My husband was completely opposed to painting the brick. We took out the carpet and put in a light laminate wood floor. We painted the dark wood ceiling and beams bright white. This picture shows that wall and you can just see the painted ceiling above. 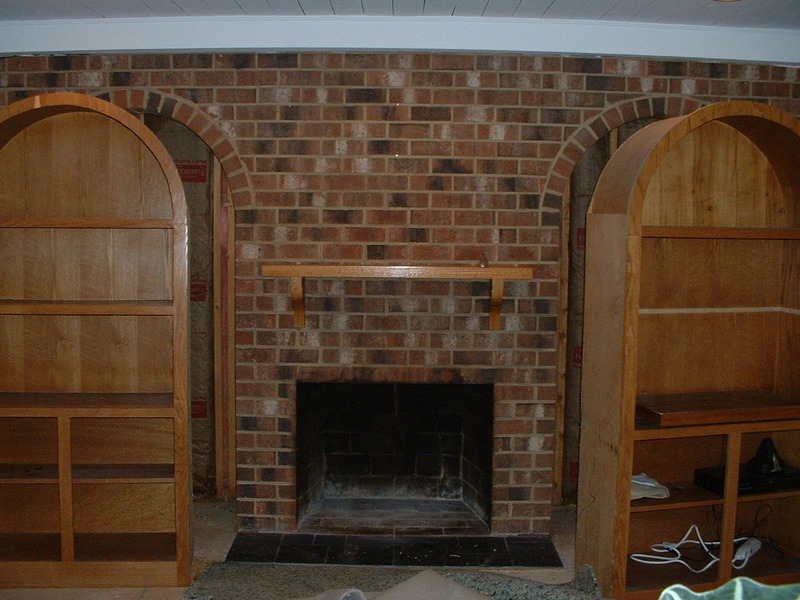 The built in bookcases actually slid out of the openings. See how brown the brick is, yuk! We found a product on the internet that is a faux painting treatment that makes the brick look like a different color rather than painted brick. It is a five step process and here is the wall after the base coat and steps 1 & 2. The bookcases look so much better painted white! Here we are just prior to the final step which is to add some of the base color as the top coat. What a transformation. This is probably the easiest painting technique that I have ever done. It only took part of one day! I have since painted the mantle white also. I should have included this before, and I have already been asked where I got this great brick paint, it is called Brick-Anew. 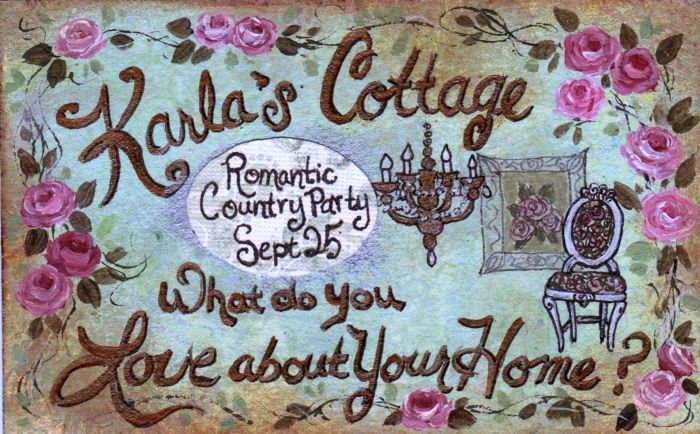 Tomorrow is Karla’s Romantic Cottage Party so I will be posting pictures of areas in my house that are my favorites so come back tomorrow and I will post a current picture of this room. WOW Suzy, talk about an extreme makeover!! It looks sooo pretty and professionally done! That must feel so great. Love your transformation! I made a note about the brick change – what a great idea! Oh, whats the name of that product, I have some 70’s brick myself! Wow~~! That IS quite a transformation! Love it! Can’t wait to check into that Brick Anew. I would enjoy some transformation and have always been afraid of just painting. 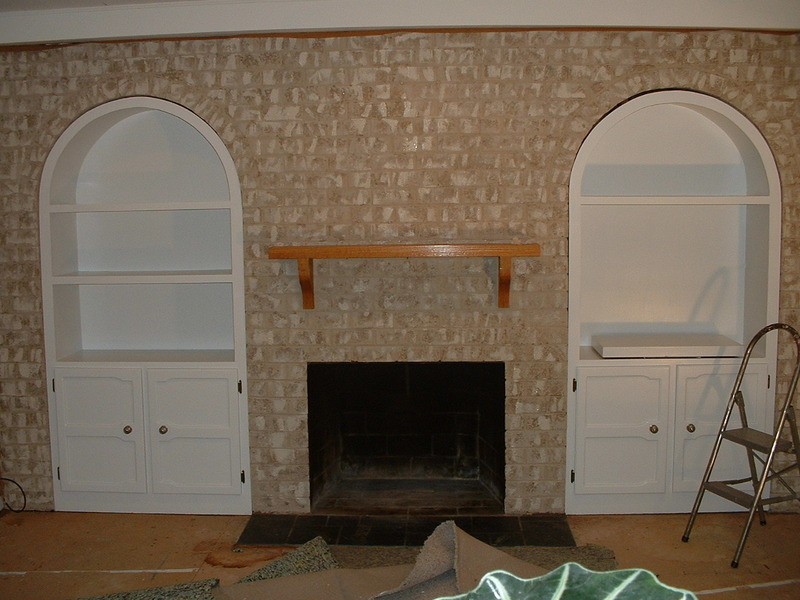 I was going to say I would have painted/stained the mantle either a dark color or white, but you did! It looks great! We finally painted over our nasty red exterior brick. It’s a pretty solid brown now. We have to paint the house. Our home is a 70s also. Wow! That is an impressive make-over! It really brightens and updates the space. Great job! You have every right to brag…that’s an incredible transformation! OMG! I love the light brick! My husband is Paint Salesman and I have to ask if he has ever heard of it, and if so, then why in the world HE hasn’t told me about it! This looks great! I am researching the Brick-Anew and also want to know which of the 3 color choices you chose and if you have any tricks/tips to share. How is it holding up? How many Brick-Anew paint kits did you need for this job? I am thinking of doing this to a large brick wall that spans both the living and dining rooms of our place. I noticed on their website that most people use it just to paint a fireplace, but it looks like the area you painted is much larger.